An emerging area of innovative social, technological and architectural development is seasteading, the research and development of cities, businesses, and other settlements at sea. As the burgeoning population of the world quickly fills the available land mass, our oceans represent the best and most accessible open frontier. The blue frontier is one where forward-thinking individuals and organizations will one day live and work on floating cities, free from spatial, legal, social, economic, political and other land-based constraints. The proceeds of the indiegogo campaign will fund an engineering study from Dutch “water-based urban development” firm, DeltaSync. The blue frontier is coming, and it may actually be our first step toward space settlement, as many of the challenges and opportunities of space development require similar holistic frameworks of research, development and innovation. Check out The Seasteading Institute’s site for more information. My father was an air-traffic controller and spent 40 years in the FAA before retiring. He liked planes, and used to take me to air shows growing up, but he was also an avid electronics hobbyist. He knew the arcane magic of transitors, resistors, capacitors, and he could read the secret code of all the little colored bands printed on them, so he constructed several of the electronic gadgets in our house from parts or kits. He liked to put these gadgets together, but they were also cheaper than buying off the shelf. My dad was frugal too. He still is. There was a company called Heathkit that sold a wide range of electronics kits via mail order, and Dad was a regular customer back in the 70s and 80s. I remember well helping him with some of his kit projects, which primarily involved me holding soldering wire steady for what seemed hours, while he mounted each little insectoid part to a green circuit board. True lessons in patience. For many years, my dad also subscribed to magazines like Popular Electronics and Popular Mechanics, which I also read. In 1982, when I was 13 years old, I saw an ad in the back of Popular Electronics for a $100 computer. It was called a Sinclair ZX81, and it came as a kit. I had some exposure to computers and wanted one, but they were expensive in those days. This ZX81 was right in my dad’s zone: a cheap kit. I knew I could persuade him to buy it for me, and he did. When the little thing came, we soldered it together, connected it to a cassette player and a black-and-white TV I had, and I entered the computing age. 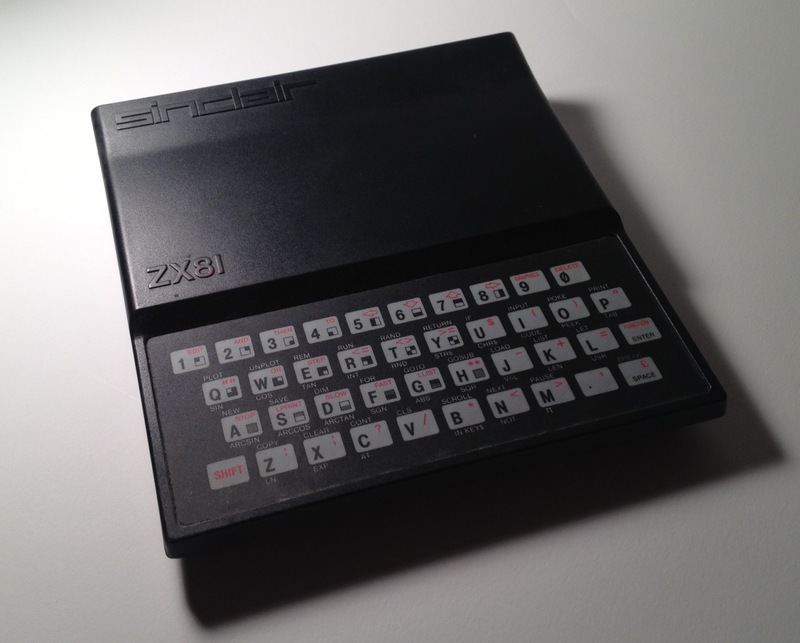 I still have this ZX81, its accessories, literature, software and ephemera. My dad saved it all for me in the same box the computer originally shipped in. He had squirreled it away when I went off to college, marriage, fatherhood, etc. He sent it back to me recently, and it’s like a little time capsule. 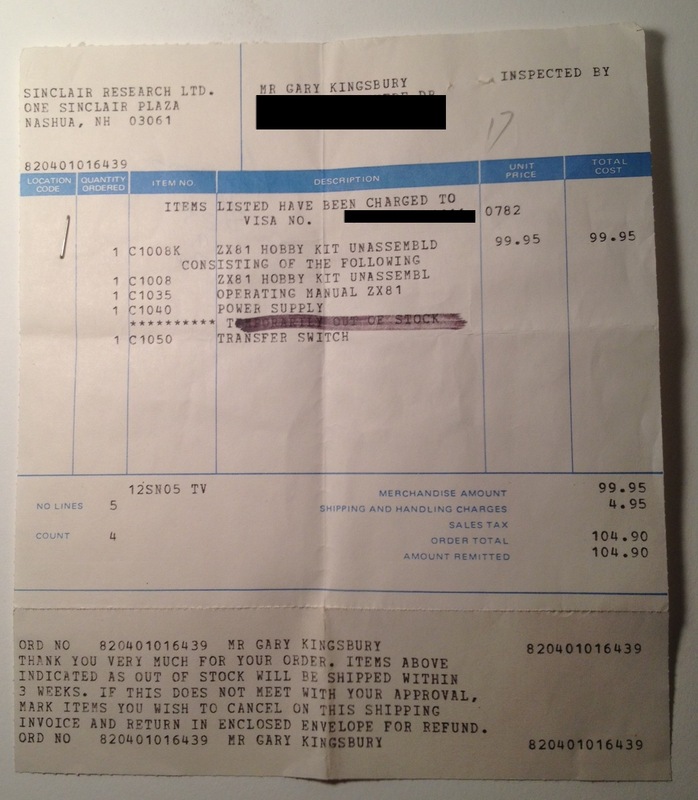 I still have Dad’s receipt, pictured below. I’ve blotted out address and credit card number, though I assume Dad doesn’t still have the same credit card number as he did then (expiration 07/82). The computer kit was shipped from Sinclair Research in Nashua, NH, although the back of the case assures me it was made in England, the home of Sinclair. Total cost = $104.90 and an afternoon of assembly. Sweet deal. Then, as now, you had to buy stuff for your computer. The ZX81 came with 1k in RAM, so to do anything useful you had to buy a 16k RAM expander, which I bought later (note the Timex brand; Timex sold Sinclair products later in the US). The games pictured below, by the way, were awesome. 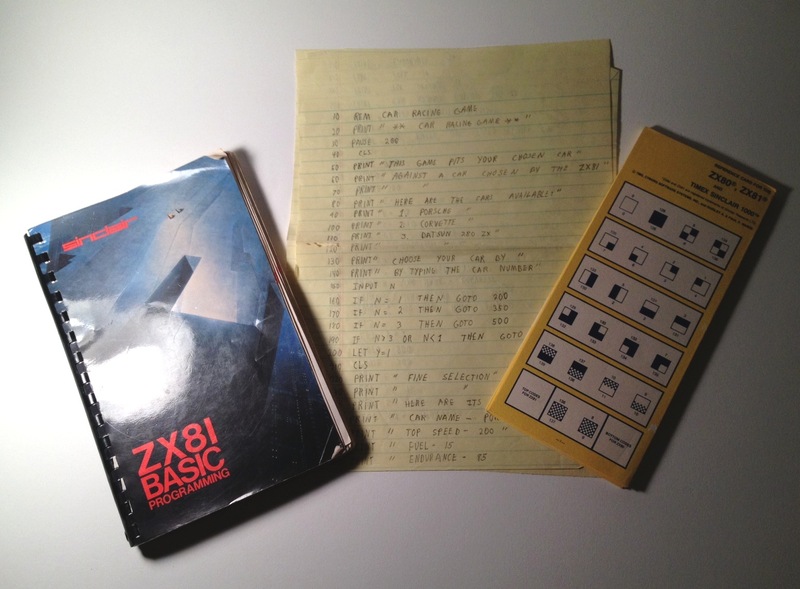 But the real fun of the ZX81 was learning to make your own stuff, learning to code. It came with a manual for its version of Basic, along with a shorter quicker guide. In the time capsule, my dad saved the code for a bunch of little games and programs I had written out on legal pads. The picture below shows the Basic for “Car Racing Game.” Not a very catchy title, but hey, I was 13. So we’ve come a long way technologically in 30 years. 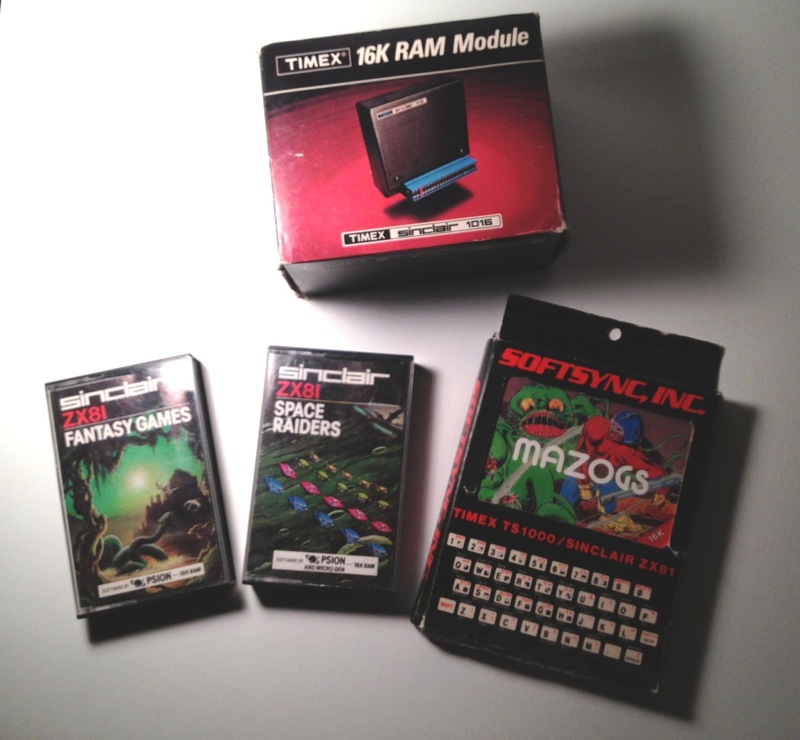 It’s a trivial point, yes, but I think looking at artifacts like the ZX81 really brings it home. The MacBook Pro I’m writing this blog on is probably further away from the ZX81 than the ZX81 was from ENIAC. Right now, by the way, my 10-year-old son is on his own MacBook Pro (his first computer), wreaking virtual havoc on some multiplayer Minecraft server. Thirty years hence, who knows what he’ll be “computing” with? Some of Space Adventures’ recent projects include partnering with Boeing on the new CST-100 space capsule (pictured below), which is being designed to ferry astronauts (and tourists) to the International Space Station. If you’re into space, it’s worth checking out Space Adventures. I’ll leave you with a video in which the company’s Chairman and CEO, Eric Anderson, talks about going to the moon.